And I think I’ve really got the thumb shaping down now. They fit so nice. I love them so much I think I’m going to start another pair tonight. This was such a nice weekend around the homestead. 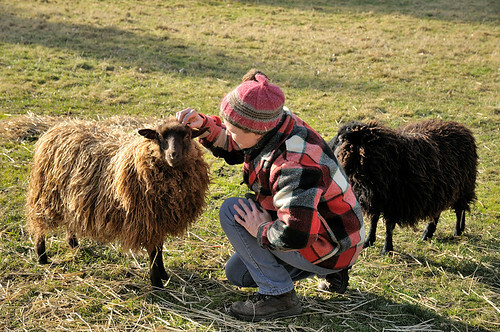 Was nice to spend some time outside, adding compost to the garden beds, hangin’ with the sheepy boys, and takin’ in some sunshine. Did the hoof routine again today, and I’m really excited to see that they are starting to look better! Seemed like they’d grown a fair bit even since last week, and the depth of the pockets between outer hoof and sole is decreasing. Was so glad to see that. They’ve been eating mostly hay since our big freeze before thanksgiving,, so I’m thinking that must account for the difference, since I hadn’t changed anything about their mineral yet. I am still planning to get some kelp meal and give that a go. See how they like it, and if they would choose that over what they have been getting. Heard lots of good things about kelp. Previous: Lab Results are in. 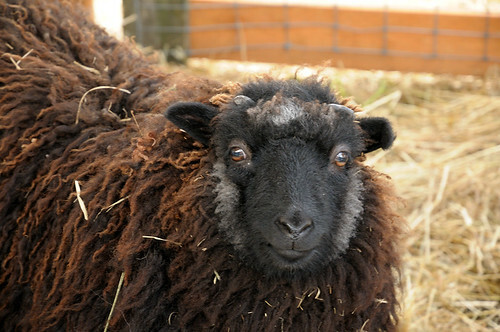 Very cute sheepie photos. Love the smittens. Is the guy in the last photo scurred or wethered? I love his marking. He looks like an Ewok! SO adorable. Mittens are fun to knit. Kind of like socks, but faster and easier. I usually knit them with thicker yarn, at a larger gauge,, but these are more like “dress up” mittens. A little lighter and more refined. (size 3 needles). The moorit cutie is Edgar (all my sheep are wethers). He is more fine-boned than his brother, Griff, but he’d actually the bolder of the two. Just chased Wally out of the pasture yesterday! The guy in the last photo is a total Ewok. Chone is my little teddy bear. Chone has an adorable face! Your knitting, as always, is fabulous. I am so glad you are seeing an improvement in the boys’ feet Denise 🙂 Those mittens are so cosy looking…I really need a pair of those babies for myself! Thanks Jody- I am too. Can’t tell you how relieved I was to see some improvement. The mittens are kind of addicting. I’m almost done with pair number two now! Chone has the cutest face! I love the mittens. I’m working my way up to learning how to knit some.